Image is of a tiny portion of Francis Rogallo's working aircraft. for your time, quality care, and continued inputs. ... you are welcome to help polish such. In middle school I understood that corporations are entities that can be created by citizens. I understood that this-or-that institution could gain and lose following, gain and lose support, live a while and then disappear, sometimes without even footnote. So, in middle school I formed clubs and movements. Some clubs rose to have a "body" of their own. And it was also then understood by me that people can gain titles in many ways from informal to formal. And I learned that I was not, as you explained, required to adopt the title impact of this-or-that entity or club or institution. And I learned that "just because 50 million Frenchmen believed" something, that such count does not force fact. A freedom grew in me about entities, titles, etc. I noticed that in some stories of humans that we seem to be given the power to name things; that power at that tender age meant to me that I could name things as part of creative action and as a means to capture meaning. And I did appreciate that others might not hear the same meaning; indeed, as I grew, I discovered that the "text" inside people nearly assures that in the first hundred go-arounds, people will not really hear each other with the meaning and deep text behind a person's utterances; language is both communal and individual; the individual Text is deep and nuanced to one's whole history. But communication is worth the effort. And I thank you for your considered contributions to the dialogue. My eighth grade social studies teacher Mrs. McLaughlin from Culver City Jr. High School very pointedly personally instructed me that I need never take a back seat to anyone as regards the standing of my own worth and creativity. In that kind of light, the institution of Self-Soar Association and the institution of U.S. Hang Glider Association need not play second fiddle to any college or university with respect to granting honorary titles to people, especially in hang gliding, as those two institutions were foundational and for a strong while S-SA was the only institution in the world for hang gliding; the context of hang gliders was international in 23 nations before there was a competing institution. In proportion, in context in a realm of specific activity, S-SA was more prominent to its field than Stanford is to its own kind of field. No need to wait on academia. At no time was anything forced on others as regards Dr. Rogallo from the S-SA. Others approaching a culture or institution also have a responsibility to get ready for differentness and different meanings. One can say "cat" to the skies without having to carve out an explanation of what that sound might mean to every ear, as such would stifle the sounding agent who would put out "cat" to the airs. The "Dr." matter was deeply covered last year with GH. I believe that he brought in the old topic for some new reason. He and I must have spent ...I guess... about 10 solid hours on just that one fine point. So goes the 100 go-arounds. In each round, there can be new and fresh insights, so blessings may still arrive. Hearing what is meant by "cat" evolves ... Growth can occur; opinions could evolve. I suspect without at-hand text reference, that others before me dubbed Francis as "Dr." In 1958 he was giving lectures to groups that all levels of initials behind their names as he was show and telling about uses of flexible and stiffened versions of his discovery. He won over a flow of millions of dollars for exploring what he presented. 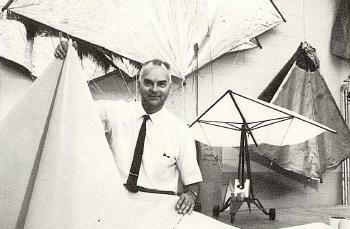 By 1960 several different groups were deeply modelling and wind testing versions of what he pointed to. People hearing Francis from 1948 to 1970 had 22 years ahead of me to call him different things. A strong robust literature search in all of his territories and scenes would have to be done to bear witness to his names and titles and respects. The toy kite world, the aeronautics world, the hearing NASA world, the Ryan Aeronautical realm, the EAA realm, the aeromodellers space, the Miller and Soaring space, letters, articles, etc. all before my actions. The organs and memos of the interior of NACA and NASA would have to be scratched to see how respect grew for the guy that had a toy that had super potential for space entry variations; they listened to him and watched his models fly, even with toy men clipped in hanging in glides. At ceremonies when he was so honored in his presence, I have not text showing any denial of the honor to him. Also, he never denied what he read in my publications. The first person in my 50 years of hang gliding writing that I found questioning the matter is GH. But recall that GH attributed Ph.D. to John Dickenson in order to put a hard bang against me; then GH had to retract that "Ph.D" as J.D. told him such an apology had to be brought out equivalently publicly. Here are today's hit counts regarding Rogallo and the "Dr." matter. Some instances reached are person who are not our Francis). The quotation marks in Google Search must be used to get the full response correctly. June 1, 2009. Stanford has in confidential files a written suggestion to award an honorary doctorate to Francis Rogallo. Among those urging a similar act was aeronautical engineer Mike Markowski who fully voted for such to take place. Energy kite systems will be needing sailmakers. John, do you place a space between "La" and "Torre" or not? Thank you for clarifying this for me. I notice others have a space and some not; and I see your use in Yahoo with no space. Do you hold it proper for yourself both ways? Some possibly fun historical images are attached.